So much has been asked about the fox recently… Is he in socks? Is he sly? And what does he say? 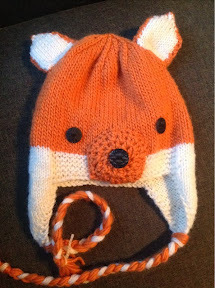 Whatever the answer, this hat is super cute. If you don’t feel like knitting your own, how about buying one here? Leave on needle, and make another. Cast on 12 in white. Slide on first ear flap. Cast on 24 in white. Slide on second flap. Cast on 12. 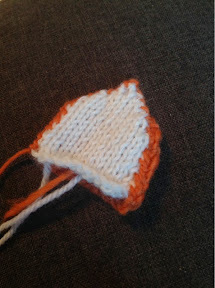 Change to 5mm needles and orange yarn. Decrease one at the beginning and end of each consecutive row until 2 remain. Chain 4, and make into a loop. 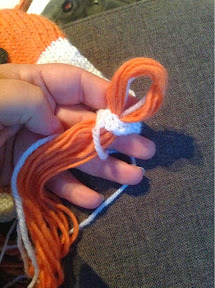 Double crochet 8 times around the inter circle. Double crochet 16 times around the middle circle. Double crochet 32 times around the outer circle. See the inner and outer ears together around the outside. 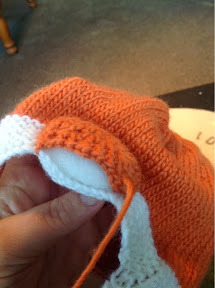 Stitch up the back seam of the hat. Stitch ears onto the hat. 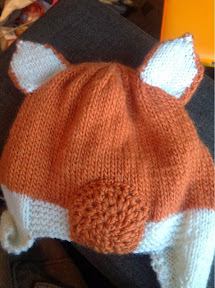 Attach nose piece to the front of the hat, and stuff it a little before stitching it closed. Attach black buttons for the eyes and nose. Thread lengths of yarn though the holes in the ear flaps, and braid to make the tassels. It should. This pattern was designed for a small, young teen, but my big-headed 4 yr old nephew fits the same size. Thank you..will try it out…I am only a novice so trusting all ends well. Good luck! The hardest part is moving from the double pointed needles to the straight needles, but the individual stitches are pretty easy. You should be fine.. but by all means message if you need a hand. Ah, well…. I am unsure of what “super chunky” or “maxi” wool are…. but I’ll take my best guess. Wool gets named all sorts of different sizes in different countries…. and I am in New Zealand. Most of my patterns are in DK or 8ply. I have used 10ply which is sometimes called ‘chunky’ with the same size needles, and the stitches just become a little tighter, but the garment more dense and warm. By a 12ply it is a lot harder to knit with the same size needles. Thank you for your reply Juanita much appreciated .. New Zealand the world is getting smaller…I am in the West of Ireland. How many balls of each colour did you use? Hi there, one of each is plenty. What size is the hat in this pattern? It fits a large child-teen-small adult head. the first line. I’m not sure what this means? I followed the directions and it came to look like an ear, or earflap. However it looks as though what I made goes no where. Q.2 If this is for a large head how do I scale down to make it for an 8 yr.? 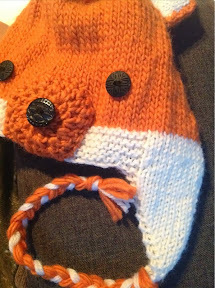 The ear flap part knits up like a triangle, then you cast on more stitches to make the brim of the hat. Then another ear flap triangle, and a few more stitches (as written). 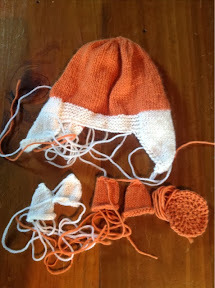 It involves a wee bit of sliding the pieces around to be ready to knit the brim. I’m not sure if I have answered your question. If not, please message me again, and I’ll try to make a wee video explaining it. That’s so awesome! I’m glad you like the pattern.